Pivoting from protest to peaceful celebration, the Pakistan Tehreek-i-Insaf (PTI) on Tuesday said its November 2 lockdown will instead be marked as a day of thanksgiving in Islamabad. Addressing a press conference outside Bani Gala, chairman Imran Khan thanked those who were part of his struggle against corruption. "Go home and rest," Khan told supporters, "You have to return to Islamabad tomorrow to celebrate thanksgiving at Parade Ground." "I am elated that the investigation into Nawaz Sharif's [alleged corruption] will begin day after tomorrow." Khan was referring to the Supreme Court's decision taken early today, where it announced the formation of a judicial commission to probe the allegations against the Sharif family in the Panama Papers. He said he was most grateful to Chief Minister of Khyber Pakhtunkhwa Pervez Khattak for his time and effort. Minister Railways Saad Rafique on Twitter said, "We welcome the decision of Imran Khan to withdraw the call of the sit-in. We should trust the apex court." Later on Tuesday, Chief Minister Punjab Shahbaz Sharif instructed Punjab police to release all PTI activists arrested during the last few days. While declaring the Supreme Court decision a "victory", Imran's announcement is a significant about-turn from what PTI leaders had been saying just hours before. The party's spokesman Naeem had earlier vowed to go ahead with the November 2 protest in the capital. Although the PTI had been continually proclaiming it would lay siege to the capital on November 2, and had managed to generate sympathy when it came to its position on the Panama Papers leaks, the protest ran into significant roadblocks. The party was facing difficuly in gathering a sizeable enough crowd as the government had acted swiftly to prevent opposition gatherings, using Section 144 in Islamabad, and separately toughening checks when it came to those crossing from KP into Punjab and the capital. This was resulting in problems for the party in sustaining the momentum of its protest. In light of this scenario, today’s proceedings at the apex court inadvertently provided the PTI with room to withdraw from its earlier proclamations of laying siege to the capital along with saving face, to some extent. Moments after the PTI changed its course, the government announced that it has ordered the capital adminstration to remove all containers and barricades in the city. Police started removing their barricades from different routes and entry points. They also started releasing PTI workers from private houses kept in different sectors, a police official told Dawn.com. 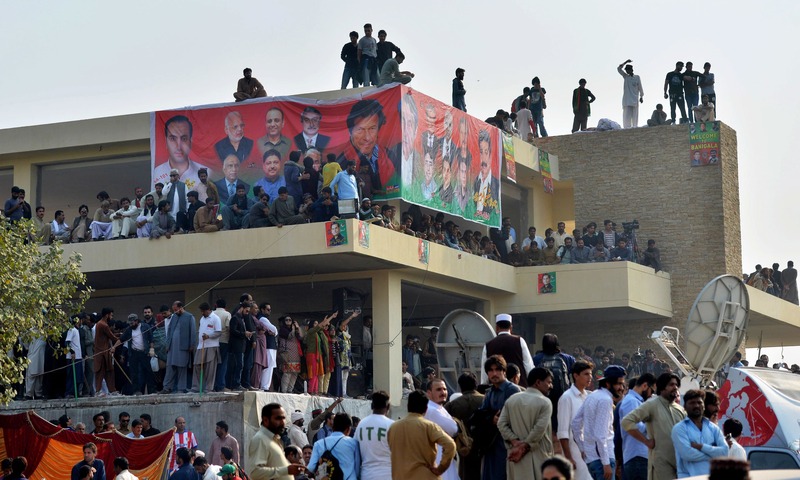 PTI officials claim that 383 workers were put behind bars, including more than 100 students. As per police record, around 20 cases are registered against these workers in different police stations of the capital city. They will be released soon, an interior ministery official said. He added that Interior Minister Chaudhry Nisar will address a press conference in the evening and will announce the withdrawal and release of all cases and workers. PTI Spokesman Naeemul Haq called for release of all detained protesters and said that Prime Minister Nawaz Sharif and Punjab CM Shahbaz Sharif should ask the people of Khyber Pakhtunkhwa for forgiveness for the treated meted out to them a day earlier. Earlier in the day, Imran Khan filed a petition in the Supreme Court against his 'virtual' house arrest, the arrest of "thousands" of PTI workers over the past three days, and the alleged manhandling of female PTI activists. The petition stated that PTI’s leaders and workers were practicing their constitutional rights to protest and movement within the country, while the federal government had ‘gone on a warpath’. The petition further stated that blockages around Khan's house and deployment of police forces there prevented him from reaching the SC today where he was due to present himself. 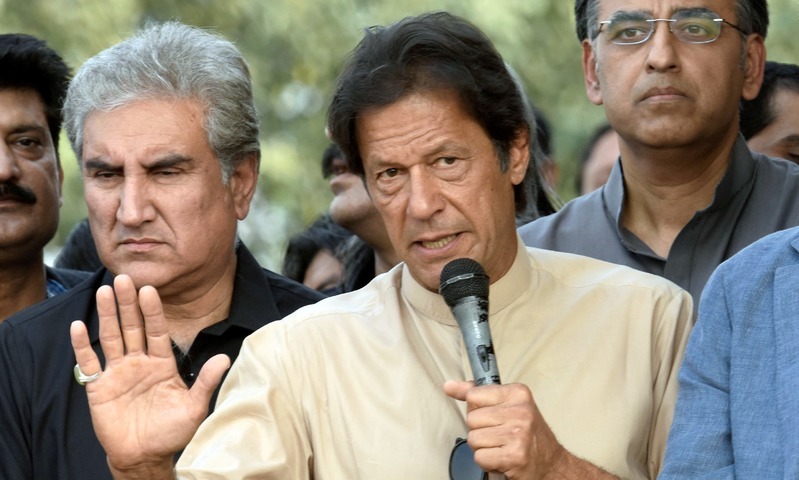 Imran Khan on Tuesday asked if asking for justice from the courts regarding government crackdown on his party workers is tantamount to pressurising judiciary. "Is asking for justice pressurising the courts?" he asked. "If we want to know from the courts [why] we are being baton-charged, roads are being blocked and women are being arrested... is this pressurising the courts?" "What crime have we committed that PTI workers are being arrested? Why was I put under house arrest?" He also questioned under which law the Pervez Khattak-led convoy of PTI protesters was stopped from reaching Islamabad. "Nawaz Sharif fought election with ISI [Inter Services Intelligence] money, he doesn’t know what democracy is." In response to a question about Sheikh Rasheed's tweet that Khan should step down from Bani Gala, the PTI chief said "the captain works according to his own strategy". He had said he has a strategy for Nov 2, when he will leave Bani Gala for the capital "no matter what obstacles" the government puts in his way. Awami Muslim League (AML) chief Shaikh Rashid Tuesday said that PTI chairman Imran Khan should have joined his protest in Rawalpindi on Oct 28. Talking to reporters outside the Supreme Court in Islamabad, he said that he does not "complain during war times" but the PTI chief should have joined his party in Rawalpindi "at any cost". On Oct 28, Imran Khan was scheduled to address supporters at an AML-organised meeting at Lal Haveli but later cancelled the plan saying his party is instead gearing up for the Nov 2 protest in Islamabad. "We want to get rid of Nawaz Sharif at any cost," Rasheed said. "Now the army need to decide if they are with Erdogan or with people," he said, apparently referring to Prime Minister Nawaz Sharif as the Turkish president. In reply to a question, he made it clear that he was not inviting the army. "Yes Musharraf was a dictator but he was better than these thieves." "We will not spare the prime minister and will follow him like a stinger or silkworm missile until and unless he is sacked from his office," he added. PML-N MNA Talal Chaudhry on Tuesday demanded that a dope test be conducted of PTI chairman Imran Khan. “Sometimes he juggles, sometimes he does push-ups... I think you should be tested for doping so it becomes clear how many banned substances you consume,” he said, speaking to reporters outside the Supreme Court. Hitting out at the PTI, he said “how can those who did not obey orders of the Islamabad High Court obey orders of the SC”. He wondered why Khan has become a “fugitive” and does not show up in court hearings. Now you know this is the end of your politics Mr Rasheed. You are not representative of NA-55. IK will not save you in next election. Shiakh Rashid running out of steam. Kudos Sheikh Sb, What a U-turn..
Sheikh's one day run more substantial than khans daily run of 10km. Shiekh the real street fighter. Imran Khan you are 100 percent right. The entire nation is with you. the street fighters running out of steam. Hurting a large majority of honest people in the process . Sheikh Rasheed and IK are on the same page. IK doesn't have PMLN-like darbaris who only act as "yes-boss people". IK has opinionated politicians around him who all give their opinions with no objection from IK. IK has a grand strategy in place and he should stick to it. November 2 is the date for one massive peaceful protest. Imran khan claims again and again that he is under house arrest yet on the other hand he comes out of his mansion whenever he wants, does push ups with his friends, talks to media anytime and asks his party workers to go away after 8 PM so that he could sleep/rest. what a joke? IK & SR want to remove NS by any means, i.e., legal or illegal? Today or tomorrow or day after ... someone, somewhere has to stand up against the biggest hurdle in Pakistan's progress. Glory to Imran for standing up today and for being that "someone". Seriously can't tolerate anymore when termed as the "World's 2nd most corrupted country". We as Pakistanis deserve much better in return of our sacrifices throughout our entire history. NO. IK, but ask them don't order them! Remember you already been to SC and apologized once, haven't you learn your ignorance has cost you a big demise in popularity, and people will not let you act ignorant! @Sab Se Pehle Pakistan No he is a leader for few from a certain province, rest of the nation don't like his immaturity! Now the picture is more clear and visible. This battle not for public or country welfare but for personal interests. So sad the lives for poor public putting on stack for individual so called 'leaders'! IK interesting statement for his worker that they must reached in Banigala even over the mountains! and he by himself couldn't reached to Pindi. Why don't he ask to workers to reach at Islamabad where the venue is fixed? Because seeking first his safety. @Hope. I see only in Pakistan that the corrupt in power ask that to go in the courts and prove their corruption. If Prime Minster was serious even he could raise an inquiry for his own children and end this issue. Brother time is changing if there are allegation against the people in power than they should prove that the allegation are not fair instead asking to others go in the courts and prove. We have to learn from the world. Mr. Khan is view point is absolutely correct it is Mr. Nawaz Shareef and his family has to prove in the courts that their money is clean not the other person will come and give proof that they have illegal money. This is ostensibly a democracy is it not? While the heavy handed tactics of PML-N have no place in such a society and deserve condemnation, however neither do the repeated agitation politics of the PTI. Imran Khan is making a mockery of our process and this sets a terrible precedent for future Governments no matter who the PM may be. Protest with your votes not with sticks and stones. Show up in parliament and raise these issues in the appropriate venue provided for all elected officials. Imran Khan is 100% right accountability starts at the top and this may sound crazy but maybe try politics for once? Why the petition has not been filed yesterday?? why we lose one day and enhance the misery of party workers!! Nawaz Sharif has gone too far this time! The right to protest does not allow IK to lock down the country's capital ''at all cost''. @Yaser Arafat - and what about the lives of those hard working class who earn daily wages and will be affected by the mad desire to lock down! @Syed Ali ... Keep in mind there is one social program for the wealthy and another social program for the poor. Who is skimming the most money off the top? I have a friend from an Islamabad banking family who does not even associate with any Pakistanis below his station in life. He has two university degrees from Louisiana State University and DePaul University. He has never met a taxi driver or rickshaw man in Pakistan. He is presently living in Hong Kong. @Sheeda Tully .... .... It is difficult to say no to that. I hope there was a civilized way to get your rights rather than what IK has resorted to. IK is fighting the case of the people of this poor country against the elite. @Hope. Yes anybody who is against corruption is immature.Its best time to stop your immaturity now. Sheikh Sahb, it not the right time to put such type of controversial statement about Ik. Its time to be positive and struggle for Nov 2. @Khan dont know whqt that means. Blame game for the personalities within the IK's camp has just begun. Let us watch closely further developments among the ranks of this camp. @Sab Se Pehle Pakistan Its a myth. Most of the people r not with IK. Now there is absolutely no justification of sit inonce SC is doing its job. Accepting judicial commission and still insisting on locking down the capital!! Tells a lot about confused state of affairs in PTI and IK's desperation to somehow get into power. He knows he does not stand a chance at winning an election even if it is completely fair. @Sab Se Pehle Pakistan Entire nation is tested by vote only. CPEC is the main thorn in the eyes of the enemies of Pakistan. Pray and hope IK succeeds in his quest. Otherwise there is no hope left for Pakistan. No other political party is carrying the banner for justice and accountability from the corrupt government except PTI. @Omer - "he does not stand a chance at winning an election even if it is completely fair." So you do accept the fact that other parties do win, because of fiddling at the polls!? That's what most people suspect. Even Donald Trump is saying the same about upcoming US elections - in the strongest democracy of all, with sophisticated electronic voting machines, administered by each state independently. Unlike in Pakistan, where the entire election cycle is controlled by federal agency. Now we know how PPP and PLM-N keep coming to power in rotation. Thanks! Sheikh has sensed some thing, either he is intimated by the heavy handed ness of government , want to make a deal on lal haveli adjoining properties or he thinks IK will be too weak after 2nd November so try to launch his own brand. PTI condition is rolling stone song " I can't get no satisfaction " And no matter what " water is coming from your side "
Ik....why u always do same stunt...at last moment u pull off leaving us alone..
@Kaash - could not agree more! @Shaukat Ali Khan - fully agree with you. So well that ends the Panama Leaks issue. Yet another Commission to be set up. Guess this will take the government to elections in 2018. And the story can then be repeated again. So boring. So atlast the government strategy worked? ?kudos to them!!! Well done Khan Sb now you are learning politics. For PTI supporters, even now you can't see through Imran Khan? stop living in fool's paradise. Chalo end of political career of khan shahab. @Seemab and you shall consider NS regime as paradise. Wish you consider your and yours kids future better. Is Nawaz Sharif a'fit and proper person' to run the country? That is the question that needs to be posed and answered. The onus is entirely on Nawaz Sharif to satisfy the country and the courts to show he is such a person. There is serious stain against his character and he needs to remove it from the public consciousness if he wants to carry on as PM. Best decision according to the circumstances to avoid collision among govt and opposition. PTI achieved more than they expected due to govt's panic decisions. Let's hope for the best of this country in result of Supreme Court decision. Waiting for the PTI chief's announcement, party's supporters danced and did push-ups. Is this some kind of joke? He is just using his workers and as usual took another U-Turn. Any way, this will be relief for the residents of the Capital. Wow!! Thanksgiving for What?? now IK wants to take credit for SC decision, does he thinks that SC decision is because of his pressure??? IK Sorry... you cannot be a Leader of People of Pakistan. Why did it take 7 months? Why does PTI have to do this every time? @sam Did I say that I consider it a paradise? but can't see you that this call for lock down was a big mistake on the part of IK which led to 3 people losing their lives, hundreds of people getting injured and creating unrest b/w two provinces, do you think we as a nation can afford all this. If you think that SC gave decision because of fear of IK, then you truly are living in a fool's paradise. Right decision IK. Salute to your spirit and determination. Objective achieved. Onus is on SC now. @ali it has already ended like dozen times. PTI will survive despite all its mistakes as long as there are issues in our system and no other serious opposition party to challenge PTI. Only PPP can take place of PTI (if PTI provides space for that). Not a fan of Nawaz Sharif (or better not a fan of any politician in Pakistan) but Imran Khan will be very disappointed when the commission finds nothing wrong doing against Nawaz Sharif. So plan for next dharna 3.0. IK took a great decision. That's a symbol of a great leader. He is the only person stand against corruption. How many commissions have been formed so far and what are the results? @MAK then? is it becasue of you or me ?? Congratulation The Great Imran Khan, You are the Great Leader. We need honest leader like the Great Khan. @Truth - Tories and Labour in UK, Dem and Rep in the US, BJP and Cong in India and a few other countries are examples from this world. But I am in favour of change as long as it is through the ballot box and not through Dharnas. Sensible and politically mature move by Khan sahib seen after long time! IK always just wasting time. Imran should get 35-40 seats in Punjab and a handful more in Sindh and B'stan as a result of this endeavor (keeping calm and peace). N-league should facilitate this as a gesture of good will and peace in the upcoming elections or even now. We all know how elections and democracy works in pakistan. Another dark day for Pakistan. All hope is lost. Pakistan may never ever be a deomocratic country where people will have any rights. "PML-N MNA Talal Chaudhry on Tuesday demanded that a dope test be conducted of PTI chairman Imran Khan."... This has to be the most foolish statement ever. Is IK going to take part in Olympics or some other sports event? @Truth Well there are for sure irregularities in election process and they need to be rectified. However, looking at the huge margin by which PTI lost, I do not think that it can be because of irregularities/rigging. That's why I said that even if we have perfect elections, PTI can not win. If PTI had lost by 5-10 seats, it would have been a different situation. But with a difference of about 150 seats between N and PTI, IK should just have focused on KPK to set an example of good governance and hoped for better result in 2018. @Sab Se Pehle Pakistan , What do you mean by " Entire Nation is with you" ? Come down to earth my friend. PTI is not the Whole Pakistan. What happened to Imran's promised that he will be in Islamabad at any cost! Did he not know that case is in the supreme court a day before? You what really happened ? he could not get enough people to show in Islamabad. So Mr. U-Turn Khan postponed the whole thing. Imran khan Congratulation !!! Good strategy has been Applied .. with smart political wisdom of imran khan i would like to appreciate your Right Decision on the Right time ??? Khan sahib has shown good statesmanship being a good political party LEADERSHIP ..congratulation!!! Khan Sahib! !Pivoting from protest to peaceful celebration, Tomorrow you will be celebrating a Thanksgiving day in Islamabad peacefully in the great interest of Pakistan . One poor young PTI worker died but no regret from Captain. So this i show it ends? So much loss of resources, time and damage to our economy. IK should reconsider his political moves. Instead of all this political drama, he should focus on next election. Voting reforms is what we need right now. Plus the nonsense talk at the PTI rally playing the national card is plain stupid. imran didnt even leave bani gala!! while his workers and party leaders suffered so much... such a farce! thanks giving day??? for what PTI achieved??... again a decision showing political immaturity. For this IK you played with the sentiments of honest patriot people? You just wasted the time of whole Pakistan and few have lost their lives, just to show there support to you .If you don't have guts to fight till the end then think before whatever you say. @Naveed 100% agree. Sheikh Rasheed showed his guts, but as usual the IK showed how immature and in consistent he is. Good and wise step by IK. Good for all. Now, the thanks giving rally!! An opportunity of face saving for IK. His tall claim of herding a crowd of one million to besiege the capital looked unachievable. To his vociferous appeals to KPK people to reach for the lock up or shut down in hundreds of thousands, only fractions of jialas could reach. It was expected to be a fiasco, anyway. Thanks Imran Khan Very well considered decision. Thanksgiving is also a democratic step. You are not misled by your aides and this shows your political maturity and not weakness. I can very well select you as the next Prime minister of Pakistan. I am confirmed IK is not a politician and he does not know how to play politics. Right decision on right time is the key of success in politics. IK is a player of cricket but not politics. Sorry, I am disappointed. Total Strategic Failure of PTI. Shaikh Rashid stood firm like a hardened steel. I think Imran Khan is lucky to have Shaikh Rashid on his side. PTI should now concentrate on the elections scheduled for 2018. I dont think peoples will pay heed to PTI's out of turn change policy any more. Nothing will change in Pakistan all are interwoven to corruptions. That's all IK. You always create extreme hype as if you would topple the government but with a signal from somewhere you surrender as if there was nothing. Please learn politics first before moving people and workers to streets. Shaikh Rasheed is a real political worker and IK needs to learn politics from him. As per PTI tradition another U-turn ..
when they seem to engulf you, when you hear the crackling of dry leaves, when you sense the foot step behind you ,then run run run for for life. Imran khan and Nazaz Sharief in ASSULT to shock and stun you now showing in Pindi and Islamabad...What a Drama what a u turn...folks.. Our country is now taking so steady a course as to show by what road it will pass to destruction, to wit: by consolidation of power first, and then corruption, its necessary consequence. A great man fighting for his nation's rights. Imran Khan, you will be remembered as a genuine leader of Pakistan in our history. People lost lives, wasted time, families suffered, injured and end results are nothing. Our politicians have two mouths, one for public to listen (hypocrisy)and other one to do KANO PHOSI at parties level (which is the landing objective). We all in Canada discussed ongoing street fights in Pakistan and ending conversation was nothing will happen while some will have pockets or accounts filled. This is called professional, organized, high caliber political styles. @Hope. You seems to be a symbol of status quo. The end of this dramatic u-turn was already known. These people are fighting for their own interests but not for the welfare of the state. In short, it would not be erroneous to say that khan sab is a great disappointment. It would be extremely onerous for him to gather such an enthusiastic crowd next time as he hoodwinked most of his followers. SC final verdict on Panamgate will set the course and precedent for future politics in Pakistan. And there will be much better control of anti-corruption agencies over the corrupt rowdy politicians. It seems backend game ended with desired results. I congratulate fellow general public for returning to normal life. Imran Khan's demand for Nawaz Sharif family's investigation for secret Panama bank accounts, has been "vindicated", as the Supreme Court Judicial Commission will now investigate it. PM Nawaz Sharif by evading TORs for investigation, plunged the nation into political turmoil for last six months. If he had agreed investigation at that time, it would have shown his honesty. Not doing so was wrong. No politician can be above the law. Today is a sad day ... cowardly decision by Imran khan to end the dharma call..
Reading comments here and listening to some political quarters and analysts on media one wonder why they do not join the direction of hope given by the SC for taking up an important issue of national importance. This one is the greatest opportunity, a precedence setter, that has the potential of setting this nation on the right path. We must hope for the best with clean hearts and watch actions do the talking. Good decision.The apex court took notice of his complaint and has started taking action on PANAMA scandal which will be unique legal case in the history of Pakistan when a setting Prime minister will be trialed.Great achievement by IK. @Feroze Danish you IK supporters really need to think long and hard. Going all senti on being termed as the world's second most corrupt country? Where did you come up with that?! Go check the facts and don't start believing whatever you read on your fb or twitter. Digital 'facts' machines. After putting the PTI workers to so much hardships , and after the death of a worker and sad deaths of two senior military officers, Imran Khan is now withdrawing the shut down. Now, I feel, all the present leaders of all the political parties are purely selfish and none is there for the welfare of the people. None of the available options are good. For the sake of peace; IK has taken best decision. He proved more mature and seasoned. TI is appearing as a deep routed national party. This is wise decision and must be appreciated restrian shown by PTI and hope PMLN will not play any further delay tactics. Pakistan doesnt afford any move or such action which paralyize entire system. Corruption is a social menace and the government must tacke it with sincercity rather to delay or start blame game. Honorable Chief Justice - Please restore the trust and faith of poor people in Judicial system of Pakistan. Please give us the right! The Court could have given the same decision 7 months ago and save the nation from all that political turmoil and agony. @Yawar Yes PTI is becoming a deep rooted party, but more people should come out and support them if we are to get rid of corrupt politicians. Now, o will take responsibility for the deaths of two senior army officers, one party worker and also a child? This is the end of Panama story and Imran Khan's party. "But would you open your doors to a 'lashkar' trying to lockdown Peshawar?" This line by Ch Nisar showed his level of maturity & great that we can now move on from this. Feel let down as an Imran supporter and a fan from India...he needs more good and sharp people in his party..this is not working! @Leo PTI has lot of sharp people, Imran needs to step aside and let others lead. Shah Mahmood Qureshi and Asad Umer are the best candidates to lead PTI. @Think twice. ..the responsibility rests with the government who carried out the shelling well before the protest scheduled on 2 November! This sounds like the last push. Please do not use democracy for Shutting down your cities,try to build your nation into a civilized one. Invest in your youth,Create job opportunities by creating entrepreneurs. people of IOK want Prosperous Pakistan,dont bring shame to IOK. @Khalid ... What a false... comments... workers were staying at Bani gala grounds. All activities were inside barriers, IK was not allowed to go out. A note to PTI, its leaders and their followers, To attempt to lay a siege in the Capital is and always be considered a threat, if you want to protest, to call for accountability of corruption against politicians, than call the masses to do so, causing havoc in the city is not considered peaceful. I don't care what party you belong to, what your complaints are, if you go about the right way, no one can stop you, to expect accountability, you must lad by example. The world is watching. Why do some politicians become hysterical periodically and launch stillborn agitation which is blown out of proportion through their incessant coverage by the tv news channels, and coming to an end subsequently following appearance in the press of a story or two about some institutions of state meeting behind closed doors. This sends out a very bad message to the international community who have already labelled us as a queer nation at more than one occasion. I think IK has been trapped in his own 'jaal' and he has no other option but to take U turn which has become his trademark. A victory for democracy and state institutions in Pakistan. A clear message has been sent that Pakistanis want accountability but through constitutional means and not street politics and anarchy. Respect for IK. Its a shame that a protest has threatened the SC to call an enquiry into Nawaz Sharifs involvement in corruption and the Panama Papers leaks. They (Nawaz and SC) saw the writing on the wall. The SC should have acted independantly moths ago. Wonder how long it will take for an enquiry to be initiated into Ayesha Siddiqas clandestine visit to Afghanistan, if it is true. People of Pakistan have a right to know. Clearly showing his inability as Political leader....look at Sh. Rashid if he can find a way why not IK. Really disappointed with his attempts to ask people to join dharna while sitting in Banigala drawing room. @U-turn IK haha u nailed it bro!!!! i think something wrong was at the bottom because PTI has decided to take agitation against PML-N suddenly they changed their plan we are very upset to hear this pathetic news .imran khan has lost his image surely people will never forget his mistake or deal which he satteled with sheikh Rashid and other fiery elements as well.when Qadri decided to refuse lockdown in capital imran feel earth quake due to their secret plan because Qadri and molana are the chips of the same block they do not have any agenda always try to get money .no matter 20,000000 people will suffer this problem again and again . really worry what will happen in pakistan As an engineer i thought i will become the responsible man of my family but after the completion of my degree though time has start now. go to hell pakistan political parties .go away please . Shame on PML. Victory for PTI. Wise decision by IK...We stand with you against corruption!! Great statesman decision by IK. This shows how mature IK is. PTI wins. Next election belongs to IK/PTI. In my opinion this is a wise decision. Purpose of PTI was to bring the culprits within the Law and not to penalize public Let us see when Supreme Court decides the matter finally. Thanksgiving for escape from humiliation of not gathering even 0.1 % of a million PTI supporters. Imran Khan not only destroyed his political career, he took the other party politicians with him. PTI party will become history just like MQM. Sad but true. Do we have thanksgiving in pakistan? Where is third Umpire? I think IK is playing very smart. Inshallah Victory is near. This is how IK fooled the general public. His face saving statement is not enough to cover up his political failures. Believe it or not Imran has not achieved anything, infact his policies has strengthened Nawaz Shareef and his party. Those criticizing IK for his decision will come to know later that his decision was right and he indirectly forced and pressurized Supreme court to take action. So depressing to see a contitutional court like SC turning into anti corruption body. This is an damming indictment of democracy in Pakistan. I hope this inquiry will succeed in cleansing Pakistan of corruption. Imran Khan and Sheikh Rashid deserve respect for their efforts. Imran's excellent political strategy and intelligent move, left all his opponents like Nawaz, Zardari, Altaf in bewilderment. He respected Supreme Court's Decision to postpone Dharna. Nawaz frightened by PTI workers, himself locked down all the main roads to Islamabad, and showed his weaknes. This gave a message to the Supreme Court as well that the people of Pakistan want a fair probe into this matter. He flip flops more then a softee in barsaat this is why the public are cautious, he had a challenge and a golden chance to improve KP nothing happend, he is trying something else and is moonwalking nowhere he is eager to get to the big chair ASAP by disrupting a democratically elected government even hinting at army takeover nothing seems to be happening there either like the famous sage McEnroe used to say, "you can't be serious man." I feel really bad for people who trust politicians like IK and TUQ; but i shouldn't as the saying goes fool me once, shame on you; fool me twice, shame on me. He has betrayed his followers once again. He will betray our nation once he gets elected. There are supporters who are spinning this situation into some form of victory, this is not victory by any standards. That was enough of a jolt to the government to comply with legal and constitutional processes. Imran Khan has made a strong point. @Yawar This has nothing to do with peace or IK's maturity. Infact Nawaz Shareef has showed his agressiveness by forcing Kaptan to go on to his back foot and in the process hit his own wicket. In any case all the political parties and political elements should strive hard for the good of the common man. Long live, Pakistan. PPP is disaster. They should have allying with IK to show their will to curb corruption. Their non alliance with PTI reflects hidden mockery and contempt for the nation. I predict that even NS is convicted and gone. A care taker PM will be appointed until next election in 2018. PML-N will win again and new face from PML N will emerge as a PM. If one believed in Sheikh Rasheed in the first place, the outcome determines ones stupidity inbred first place. It is not that SR's plan turned upside down...he thought through it wrong in the first place. why focus on IK's character when the one who is going to court is Nawaz Sharif? our focus should be on panama papers and nawaz sharif trying to evade this issue. 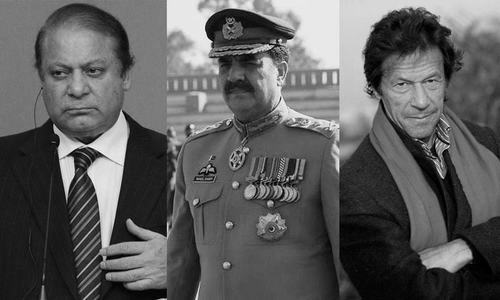 Imran Khan's personality/history is irrelevant! How can a CM order release of prisoners? he has no right to interfere in the process of law. where is democracy in such cases?nobody talks about when these political leaders interfere in police work, judicial investigations, appointment of teachers and POLICE officers etc. this is bonkers as this is not a democratic system but worse than martial law as there is some sort of accountability even in that system. iNDEED tHE WINNER OF ALL THIS dHARNA ePISODE IS oNE AND oNLY sHEIKH rASHEED aHMED. Imran has proved himself a worthless lying coward rat. IK dEFeated...its obviouS hes not even going to win any decent number of seaTs in the next election. The Number of people he has been able to gather from all over pakistan, is less than even what is required to win a single national assembly seat!!! pti should broaden their horizons not have a container mentality. mr. khan, what is that you thank about? Imran Khan did not do a "U Turn" as Mariam Nawaz would have believe. He made a wise and clever decision. He inspired the people of Pakistan to stand up and denounce the shameful corruption by Nawaz & Co. The onus is now on the judiciary to dispense sentence. Pakistani judiciary is on trial, and the entire world is watching. The removal of the Nawaz Sharif will surely help foreign investment to come back to Pakistan. Well done Imran Khan and all his supporters.